Since the beginning of the Colonial Period, the effective distribution of mail became one of the priorities of the Spanish authorities. For this purpose, the routes between Spain and its new colonies were defined in the 16th century, and organized postal systems in each dependency were created starting with the Correo Mayor de la Nueva España in 1579. The Correo Mayor de Guatemala y sus Provincias (which included the present-day territory of El Salvador) was created in 1602. There were six Correos Mayores before the King Charles III nationalized the service in 1768 as part of a substantial change in the Spanish postal system. Afterwards, the service was nominally under the control of the Captain General aided by the Principal Administrator, who set the routes and rates in the territory, until Independence in 1821. During the Colonial Period, there were 18 estafetas or post offices in what is now El Salvador. Although the Central American Federation attempted to regularize the postal service between 1824 and 1826, political unrest and the lack of funds to sustain it led to its almost total breakdown during the 1830s. 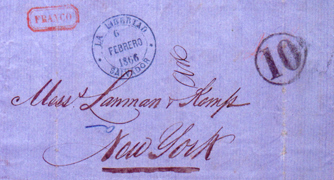 When the Federation dissolved in 1839, El Salvador kept a very limited mail system until 1849, when Escolastico Andrino was named as the first Postmaster General of the State. During the 1850s and 1860s the service underwent a significant reorganization and expansion that eventually led to the introduction of the first postage stamps in 1867.